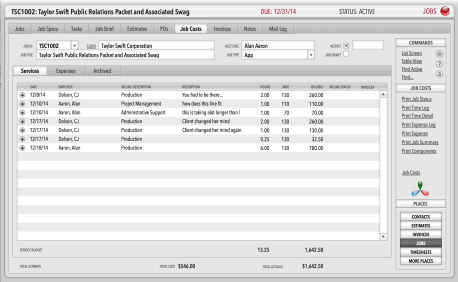 Studio Manager 13.1 Job Cost tracking – click for full rez. We are still working to get everything just so in Studio Manager 13.1. 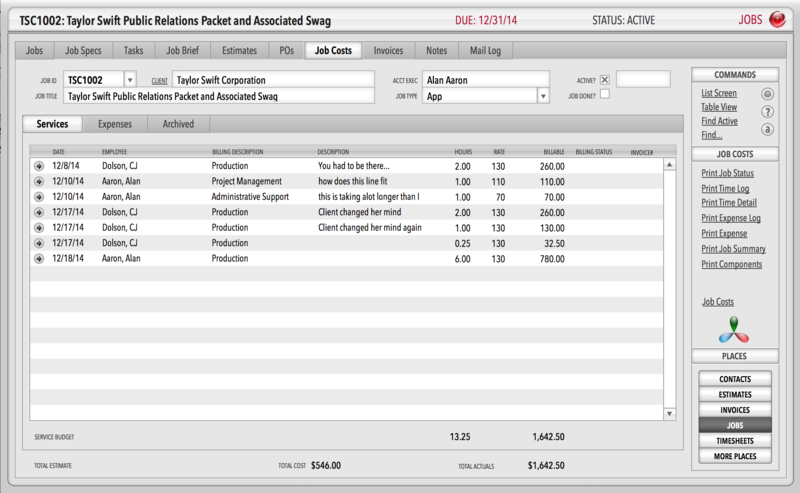 Studio Manager 13 is about taking advantage of new features in FileMaker Pro 13. FileMaker Pro 12 got us part way to a new land based on FileMaker’s database-flavored brand of CSS throughout. FileMaker Pro 13 finished the job. We did a lot of time on SM12. Then we took advantage of a lot more control over the layouts that we got with 13. Now with Studio Manager 13.1, we support the iPhone 6 and 6 Plus. These are iPhones made for Studio Manager and we have been enlarging and providing more functionality with these big screens. But don’t forget, most creative services firms still sit still at big screens a lot of the time and Studio Manager still excels on the desktop and laptop above all else. Here’s a Mac screenshot to show you what we mean. The retina-friendly screens will fit 13″ laptops and can be bumped to 150% with a click if you want to go big on your desktop. Click the screenshot here to see it in full quality. I have the demo version of Studio Manager 13. Is the finished version available for download (the new year is right around the corner)? And if so, am I paying the upgrade price of $278, or possibly $313? Thanks and best in the new year.